The exorcism movie has been a staple of the horror genre ever since "The Exorcist" debuted in 1973. It has experienced a resurgence in recent years with several such films hitting theatres and DVD, mostly boring and tired retreads but a few have really moved the genre forward. 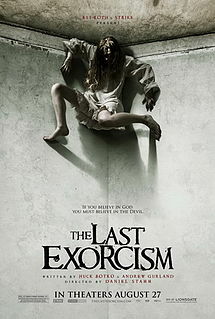 "The Last Exorcism" is one such movie. It takes on a faux documentary style with handheld camera work, a small budget and unknown actors to really drive home an authentic feel. Produced in part by horror icon Eli Roth, this film has a great pedigree and hope for greatness. While costing only a few million dollars it brought in more than $40 million at the box office. With results like that it's no surprise that a sequel in on the way. Growing up with a southern pastor as a father Cotton Marcus (played by Patrick Fabian) has followed in his footsteps ever since he was little and now after years of being a pastor himself, he is ready to get out of the business. He has a documentary film crew follow him as he "performs" a typical exorcism. He wants to give away all of his secrets and how everything is staged and nothing but a big sham to bring in some extra cash. He answers one of the many letters he gets asking for help. Upon driving to the Sweetzer farm he meets a very sweet and innocent teen girl named Nell. He does some "tests" and agrees to do an exorcism on her. This goes like planned and he has another happy customer; until. Nell mysteriously appears in Cotton's motel room in a trance-like state. Cotton doesn't believe in demonic possession and thinks that Nell is suffering from some sort of mental illness and takes her to a hospital. The story is very effective in establishing Cotton's character and his motivations. He has lost his faith and wants to show us how fake his job can be. Obviously, exorcism movies rely heavily on the possessed victim and the performance by Ashley Bell, who plays Nell, is spot on. She gives a fantastic performance showing fragility and vulnerability while also showing a devilish side that is quite shocking. Cotton goes back to the farm and finds himself confronted with a potentially real possession case. Nell has some obvious problems but are they demonic in nature? The third act of the film really kicks it into high gear and introduces another bizarre element to the story. The ending is loved by some and loathed by others, but this is one horror film that needs to be seen. "The Last Exorcism" is currently available on Netflix watch instantly.